Welcome to Katfrog's Corner: Starbucks Holiday Cups - What's the Big Deal? 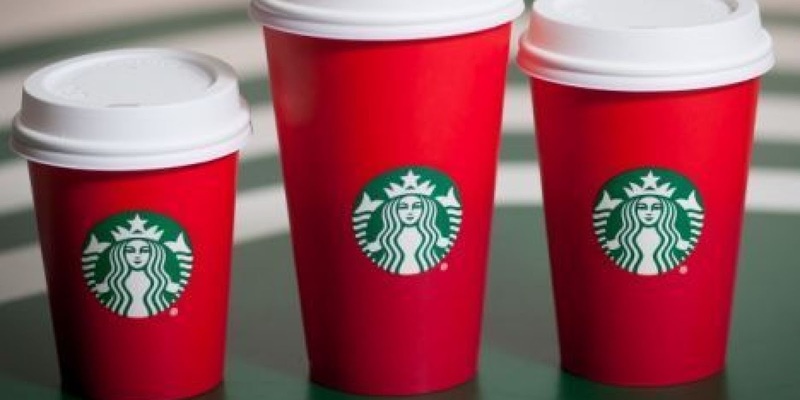 Starbucks Holiday Cups - What's the Big Deal? Have you heard about the big brouhaha over the newest Starbucks holiday cups? For the past week or so, I read headlines about Christians upset over Starbucks holiday cups this year. I finally decided to read an article to understand what the problem is. And I was floored by it. 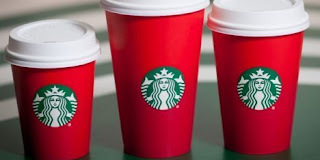 The issue is that Starbucks is using plain bright red cups for the holiday season this year. Previous years saw snowmen and snowflakes on the cups. So some people have interpreted the lack of snowflakes and snowmen as an attack on Christmas. One of these new "Christmas" crusaders even went onto Twitter to crow about how he "tricked" Starbucks into writing "Merry Christmas" on his cup by claiming that was his name. The cups never said "Merry Christmas" before, so I am uncertain as to how this is a trick. Starbucks hasn't forbade their stores to decorate for the season either. They simply now supply plain cups so that people can either write or draw on them. The level of public outcry over this demonstrates that we need to stop telling people that it's okay to be offended by everything that doesn't go their way. It's not a verbal message, but it's definitely a social message being passed around. Maybe it's time to tell people to put their grown-up pants on and deal with it. Well said! I would think people have better hobbies in life than being outraged by every little thing. But apparently not.